SANTINI - [2 maps] Partie Septentrionale.. Partie Meridionale du Royaume de Portugal..
SANTINI, P. / REMONDINI, M. - [2 maps] Partie Septentrionale.. Partie Meridionale du Royaume de Portugal..
[2 maps] Partie Septentrionale.. Partie Meridionale du Royaume de Portugal.. - SANTINI, P. / REMONDINI, M.
Size : 19.2 x 21.5 inches. / 48.8 x 54.5 cm. 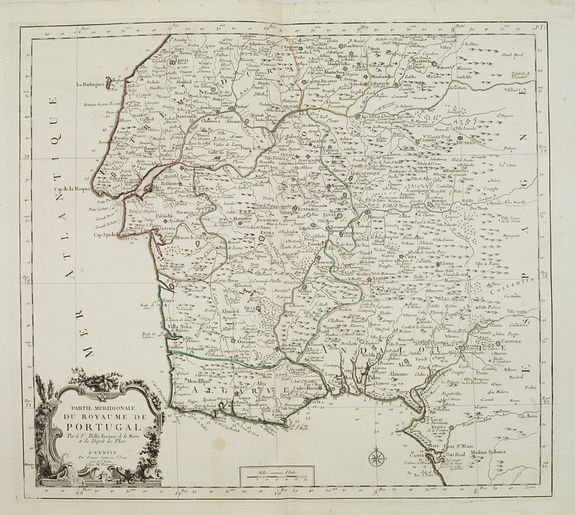 Description :A detailed two sheet map of Portugal showing the roads, prepared by N.Bellin. Venetian edition of the map by Bellin, to whom Santini gives credit in the cartouche. From "Atlas Universel" published by Santini in 1776-84. The atlas is effectively an Italian copy of the Robert de Vaugondy 'Atlas Universel'. In 1784 Santini sold the plates to M. Remondini, whose name appears on this particular example. Condition : Good and dark impression, printed on heavy paper. Faint brown spot on the right of the title cartouche. Else very good condition.